Weatherstrip, inner beltline. Thick pile lined, without chrome bead. 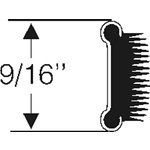 Nine sixteenths (9/16) inch high by nine thirty seconds (9/32) inch thick, two four (4) foot lengths. Weatherstrip, door window inner and outer, front and rear doors. Seven sixteenths (7/16) inch wide, with chrome bead, mohair faced, flexible. 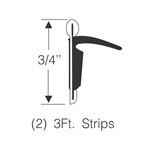 Two (2) three (3) foot strips. Bend to fit. Weatherstrip, outer beltline (sometimes called "scraper seal"). 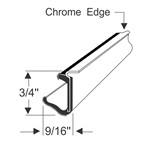 For use on front, rear, and quarter windows without a chrome reveal molding at the window beltline. Small stainless bead with rubber lip. Three (3) foot length. 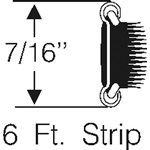 Weatherstrip, outer beltline (sometimes called "scraper seal"). For use on front, rear, and quarter windows without a chrome reveal molding at the window beltline. Small stainless bead with rubber lip. Six (6) foot length. Weatherstrip, window sash channel (beltline), inner. 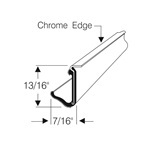 Rigid, rubber covered weatherstrip with flock lining and one fourth (1/4) inch chrome edge. 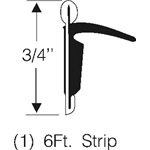 Used on front door, rear door and rear quarter window. 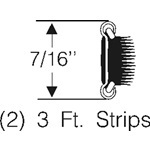 Six (6) foot strip.